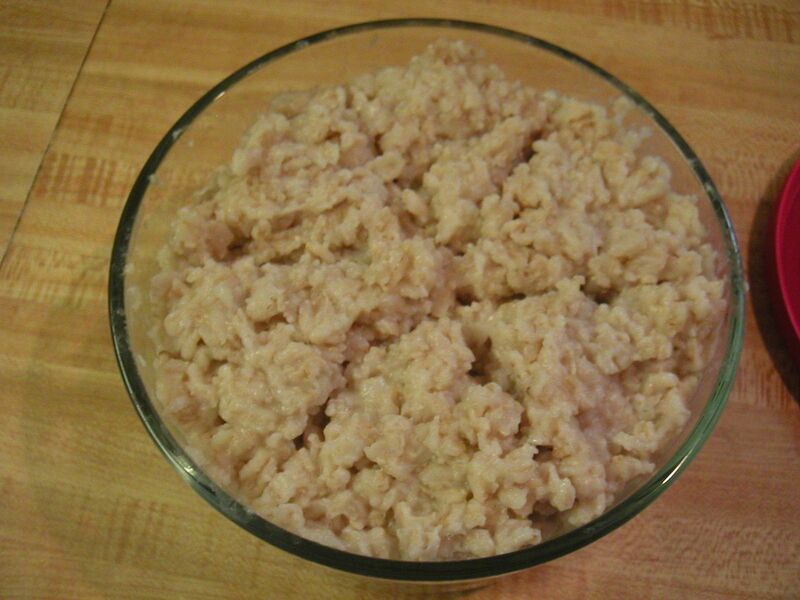 See also printable pdf version of this photo-essay: ‘Sourdough’ Oatmeal Porridge. Last month I wrote a photo-essay on ‘Sourdough’ Pie Crust. It uses yogurt rather than sourdough starter to ferment the flour, since the leavening ability of sourdough starter is not wanted in a pie crust. This same method can be applied to other baked goodies such as cakes, cookies, coffee cakes, and quick breads. And it can also be applied to cooked porridges. But why would you do this? It contains phytates that bind the minerals so you cannot absorb them. It contains toxic lectins (natural pesticides) such as WGA (wheat germ agglutinin) and alpha-gliaden (the problematic part of the gluten complex). Many of its minerals and cofactors are bound in such a way that you cannot utilize them. (See my post: The Problem with Unfermented Grains for more on this). Sprouting or fermenting the grain resolves most of these issues, improving the healthfulness of the grain. Fermentation involves extended exposure of the grain to a moist, acidic environment, such as that provided by sourdough starter, or a long soak in a water-yogurt mix. 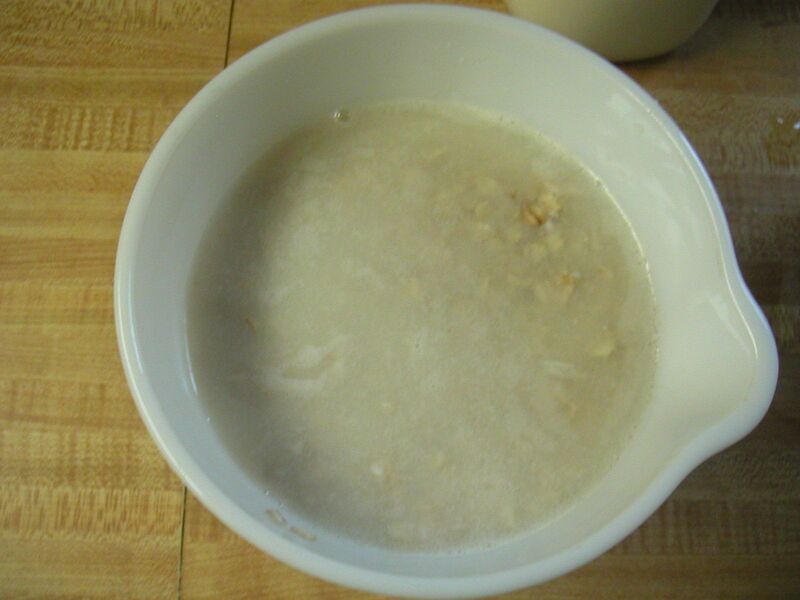 In the case of porridge, overnight fermentation followed by a long cooking time accomplishes the same goal as using sourdough starter to make bread from flour. It is also best if you roll (flake), or steel-cut the whole oat groats right before fermenting or cooking, for the same reason that fresh-ground flour is best (see my post The Importance of Grinding your own Flour for more). NOTE: this same method can be used for other grain porridges such as 7-grain or 9-grain. See also printable pdf version of this photo-essay: ‘Sourdough’ Oatmeal Porridge (pdf, 400 kb). It includes more photos. 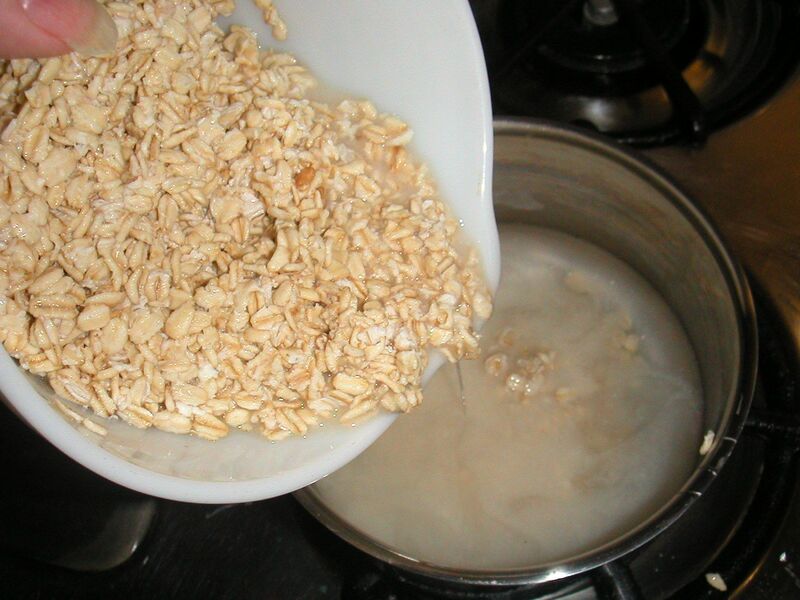 Opening a package of instant oatmeal is certainly much quicker, but is far from having the optimal nutritional value provided by old-fashioned porridge. 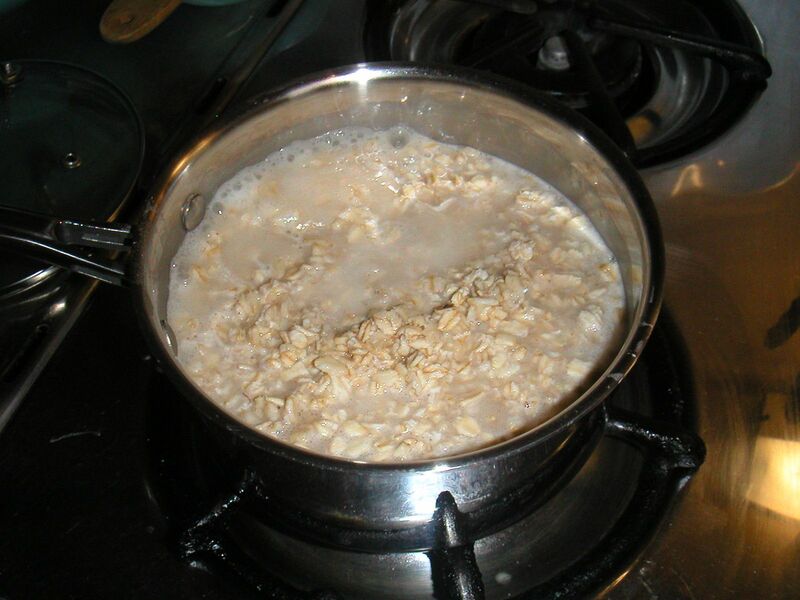 So I make up a large batch (6 or more servings) of porridge, and store individual servings in the fridge or freezer. Reheating is easy in a steamer pot. This recipe makes 6 servings, but you can easily modify it to make more (or fewer) servings. You also need a heavy-bottomed saucepan, with lid. Good quality stainless steel or enameled steel, with an all-clad aluminum or a copper disc in the bottom for even heating is best. 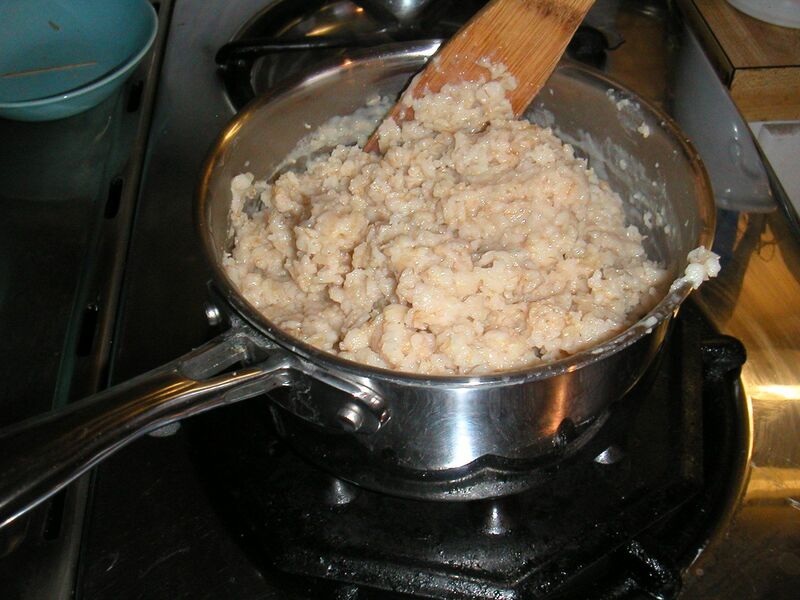 Don’t use aluminum because the fermented oats are acidic and will leach aluminum into the porridge. 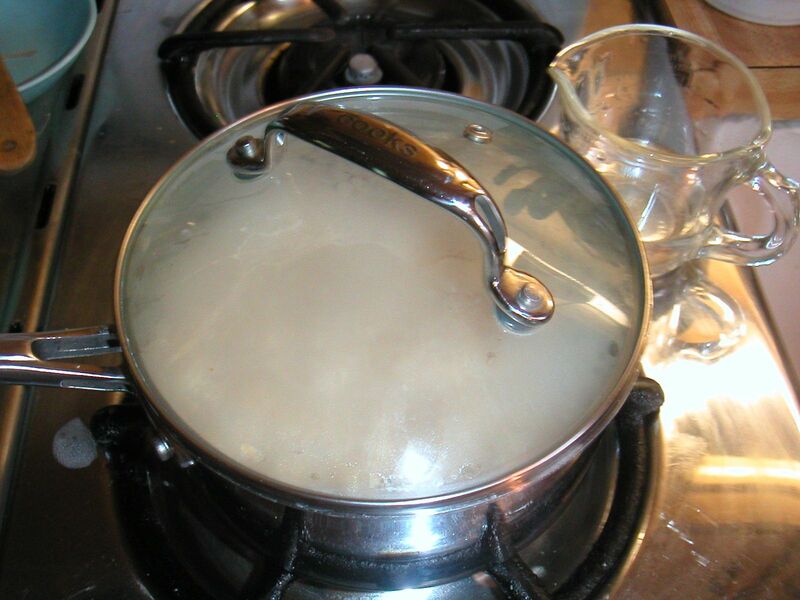 Or you can use a double boiler. My saucepan is stainless steel with an all-clad aluminum disc on the bottom, and a tempered glass lid so I can watch it cook. warm water (should be filtered or at least chlorine-free). 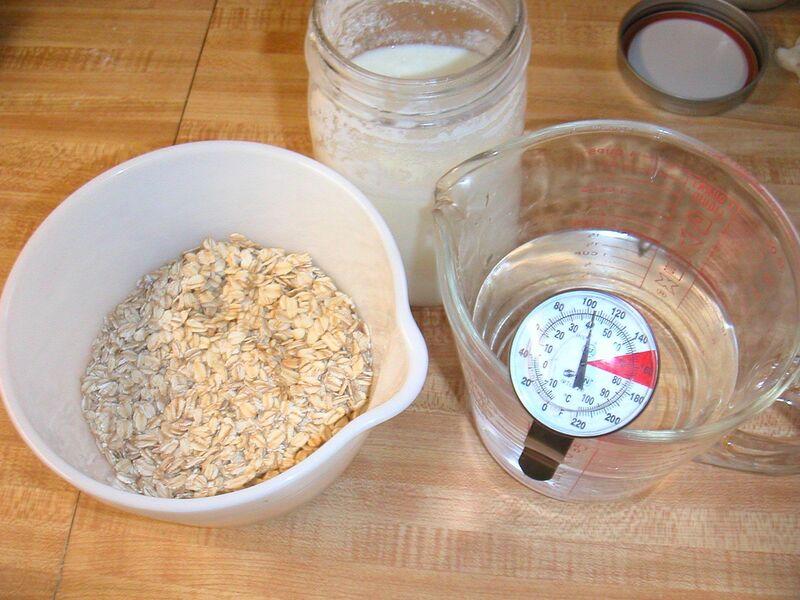 Choose a bowl that will allow the oats to double in size as they absorb the liquid. 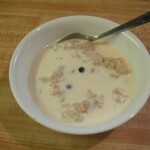 Measure oats into the bowl; warm the water to 105° – 110° F; have the yogurt ready. Measure 2 Tbsp yogurt and stir into the warm water. 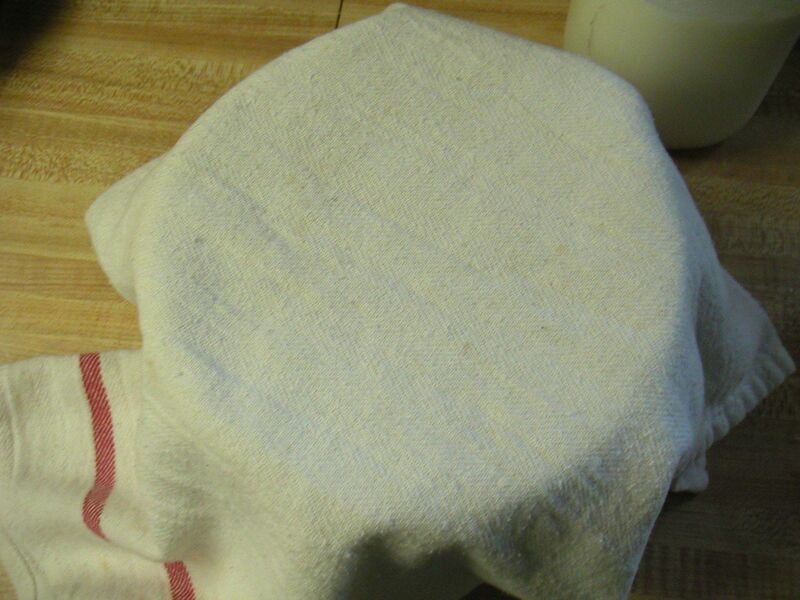 Cover the bowl with a cotton dishtowel, as fermentation happens best in the dark, and the cloth will also keep debris from getting into your ferment. Salt: I use Real Salt, pictured in a steel canister, or other unrefined sea salt. I do not recommend iodized salt. 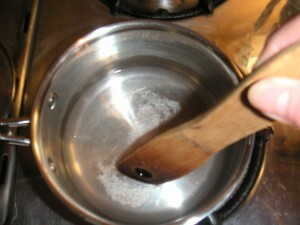 Measure 1 cup of water into heavy-bottomed saucepan; add salt and stir to dissolve. Add fermented oats to saucepan and stir to combine. 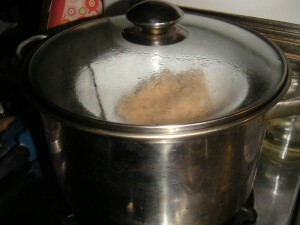 Bring to a slow boil over medium-high heat – just until it begins to bubble. Reduce heat to low and give it a stir. Let it bubble very gently, stirring occasionally, for 10 minutes or more. Add more water if needed to keep it from sticking to the pot. The more water you add, the larger the volume of porridge, and the softer the oats. I like to cook it at least 20 minutes and usually add 1/4 -1/2 cup more water. Note that the longer you simmer the porridge, the more nutritious it gets (more gluten is broken down, more minerals are released from the phytates). Stir in a bit more water (1 Tbsp or so); cover saucepan and reduce heat to lowest simmer. I have to use a simmer plate because my lowest gas flame is too hot. Let it rest at lowest possible simmer, 5 – 10 minutes before serving. It should have fully absorbed all the water and be quite tender and fluffy. To serve porridge: Thaw first (if frozen); reheat by steaming for 10 minutes. Garnish with honey, fruit, nuts, cinnamon or other spices. Add a pat of butter, or pour milk or cream over the porridge. Another option is to sprinkle some ground flax seeds over the porridge when you serve, to enhance your Omega-3 intake. Enjoy! To store: Transfer to storage container(s) and let cool before adding lid and transferring to refrigerator or freezer. This amount lasts me 1 week, so I pour the porridge into a single container, divide it like a pie into 6 servings, and keep it in the fridge (covered with the red lid). To reheat a serving: Transfer to bowl and heat over simmering water. I use a simmer pot with basket to hold the bowl above the water. Or you could use a double boiler. This entry was posted on Monday, June 20th, 2011 at 11:52 am and is filed under Fermentation, Culturing & Curing, Food-Nutrition-Health, Health. You can follow any responses to this entry through the RSS 2.0 feed. Both comments and pings are currently closed. thanks, can’t wait to try this. Thanks, I have tried this and the oatmeal porridge is great! we’ll see if this works!? You’re welcome! We are always glad when new people find our website and information useful. I think your idea of using a crock pot is a good one. I just don’t have one, and I love cooking on my 1949-vintage gas range. The crock pot porridge worked out just fine. I’m soaking cabbage in it today. Hopefully, there will be kimchi in a couple days. I’d share some ferment with you, but, I’m a Hoosier: yeah, the kind that lives in Indiana. I would trade my crock pot for your stove, 1949 was the year I was born!! I have been interested in fermented foods for a few weeks, ‘have no idea how i happened on to your web site. I would like to be on your E-list. I’m 85% vegan (100% macrobiotic for 39 years), eating fish/seafood 1-2 times a week, and therefore avoid dairy foods! 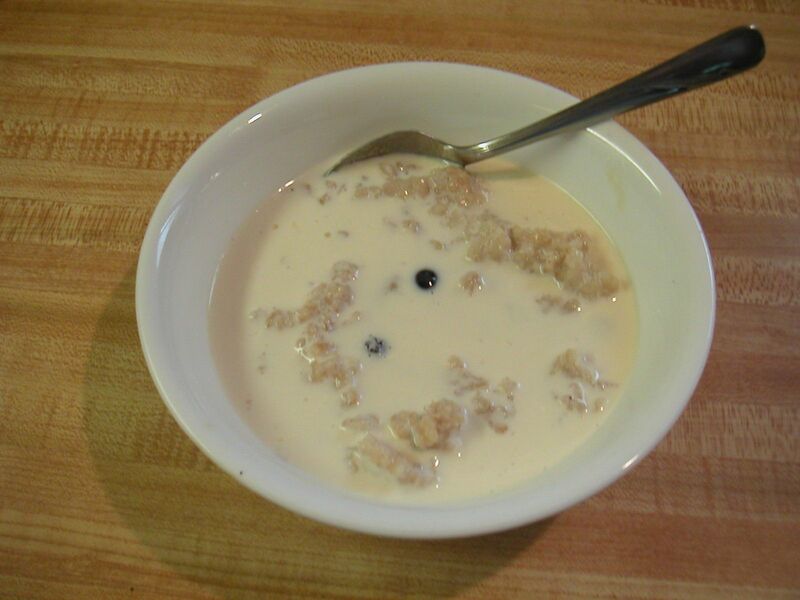 Is the reason for adding yogurt, to provide certain microorganisms to the fermenting grain that might not otherwise innoculate the grain from the air that the grain is exposed to at the time that the grain and the water are open to the surrounding air? There are many other helpful cultivated microorganisms available in other products such as soy yoghurt, almond yogurt, miso, natural soy sauce and possibly even sourdough starter that could be used to provide helpful microorganisms that contribute to the release of phytin and the break down of the fibers and starches to make a more digestible and nutrient assimilable whole grain breakfast food, wouldn’t you agree? I came to this site because I’ve been searching for the fermented porridge information that I read about more than twenty five years ago in a alternative foods based magazine called the East-West Journal that published an article about a eastern European or Scandinavian fermented breakfast porridge that I’m interested in making! A youTube video that I watched before coming here suggests that you cand mix rolled oats with water and a teaspoon or two of yoghurt and soak for a day and eat straight up maybe with some fruit without even cooking the oats! Greetings to you in Boston! from Bigfork Montana. The reason for adding the yogurt is because it provides the right acidity for the native good microbes on the grain and in the air to multiply and ferment the grain. You could use lemon juice or vinegar, but I like the flavor of yogurt. I do not recommend soy products like soy yogurt, because soy is very hard to digest and full of anti-nutrients. However, fully-fermented soy products (miso, etc.) are OK because the fermentation breaks down the anti-nutrients. Another reason for avoiding soy products is that most commercial soy is GMO, and even Organic soy can be contaminated with GMO. Yes, I have tried the soaked but not cooked oats and it is good. However, I have a harder time digesting the raw fermented grain. Another consideration is that all grains (and other seeds) contain anti-nutrients (toxins) designed to keep birds and other animals from eating the seed (preservation of species). Sprouting and then fermenting the grain is the best way to break down the anti nutrients. 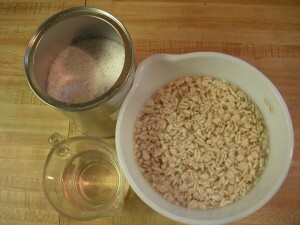 However, for oats, a long cooking time – especially after fermenting – also does a fair job. The main anti-nutrient in oat is avenin, a relative of gluten. For Bruce, the editor, and anyone else’s who cares – the vegan alternatives for yogurt in fermented grain recipes include fresh live water kefir, unpasteurized apple cider vinegar, or sourdough culture. All of these have the acidity as well as the live cultures which will begin fermenting or ‘digesting’ grains. Sourdough and water kefir will handle grains better, generally speaking. You will need to adjust the amount used to suit your taste: go lightly on the sourdough, and kefir really depends on how you have brewed it. Thanks for your addition to the vegan substitutes. 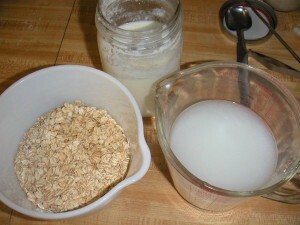 Here are a few more: coconut water kefir and almond yogurt (use dairy-free culture to ferment the almond milk). I do not recommend soy yogurt as soy has nutritional issues that are highly debated. Sourdough starter will definitely work; in this case, if you eat a fair amount of oatmeal, I suggest making a sourdough starter with a combo of oats and wheat. You could do just oats in the starter but they don’t have a lot of the enzyme that breaks down the phytates (mineral binders); adding wheat to the ferment provides those enzymes. As I mentioned in earlier comment, freshly squeezed lemon juice also works great, as it has the right acidity and provides culturing bacteria. Don’t use reconstituted lemon juice from concentrate because it has been pasteurized. Hello – I loved your article on the fermenting oatmeal, but I have one question – I am reading about using kefir and other ferments – but what about kombucha? That is lactic-acid ferment – should that not work as well??? Or does the anaerobic nature somehow contraindicate? Bonita: Both kefir and kombucha contain yeast in the culture, so it’s possible they will create alcohol rather than lactic acid, when mixed with the oats. I suggest you give it a try as an experiment. Let me know how it goes. I am soaking flour for pancakes for tomorrow, but is set greek style yogurt ok to use for this purpose? Or do I need regular yogurt? The key for soaking flour is to use an acidic medium. I like to use my homemade yogurt because it also adds probiotics to the mix, but any yogurt will work. I don’t not recommend Greek-style yogurt if it has been sweetened with honey or other sweetener, as this could encourage the production of alcohol instead of simply soaking the flour. Other acidic things you can use include lemon juice (fresh squeezed is best), plain unsweetened kefir, buttermilk and sour cream. Best of luck to you on your experiment!